Acacia fuses the traditional and authentic aspects of Thai massage with a deeply relaxing modern spa experience. Enjoy a relaxing treatment with our Thai therapist. 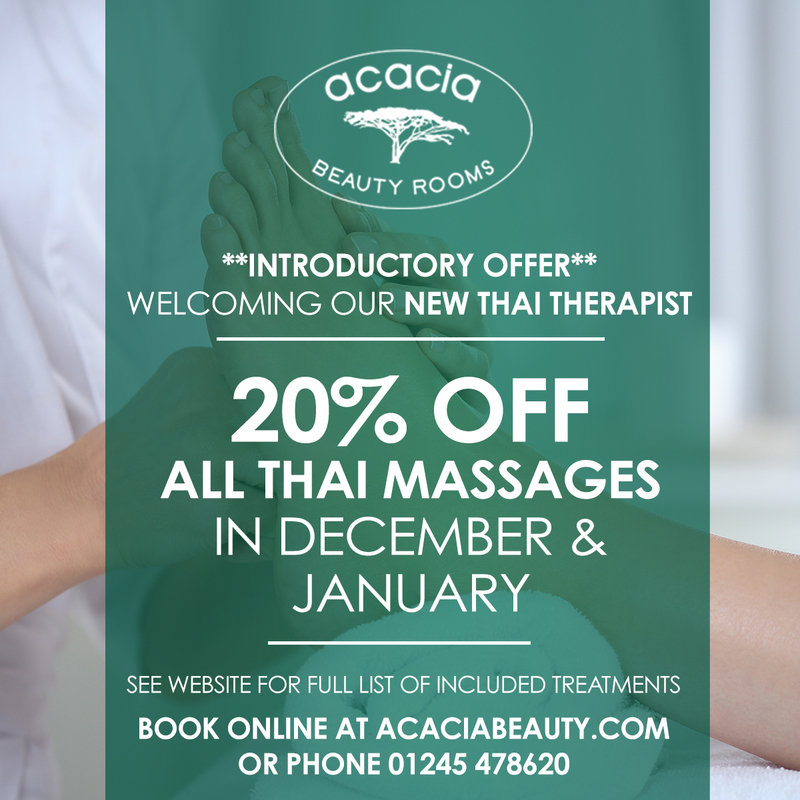 Acacia has a new therapist who is from Thailand, so we are the only truly authentic Thai massage in Chelmsford! Please join us and welcome Kanjanarawan to the Acacia Team. Kan specialises in Thai Massage, Sports Massage and Thai Foot Massage as well as all other therapies. Kan has trained in Bangkok – Thailand and we are incredibly proud to bring authentic Thai treatments to Chelmsford. We can fully recommend a massage if you like a firm pressure and lots of stretching to take away all tension. Have a look at our full body, neck and shoulders, or foot thai massage and book your experience now. Throughout all of December and January – we are offering 20% off all of our Thai massage options (listed on the page Thai massages in Chelmsford) – phone 01245 478620 or follow the link to book online!